Not all Kakadu roads are unsealed, in fact the vast majority are 2WD friendly. 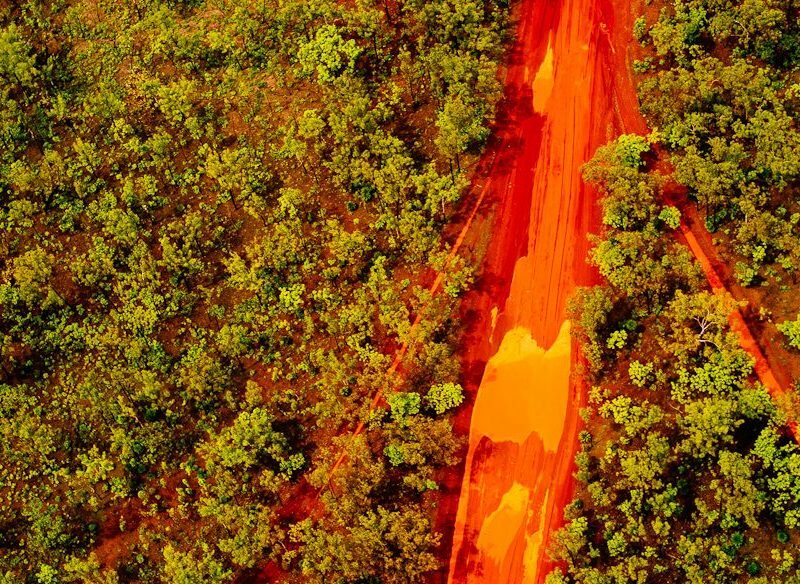 There are two ways you can drive around Kakadu: on the bitumen or in the dirt. Getting to Kakadu is easy. From the south it’s 150 kilometres from Katherine, via the Stuart and Kakadu highways. Most people come from Darwin though (that’s the closest airport), which is also around 150 kilometres from the edge of the park, via the Arnhem Highway. Both roads are sealed, open all year, and in fairly good condition, although you do need to keep an eye out for wandering cattle, buffalo and kangaroos. The view from Ubirr Kakadu at susnset. 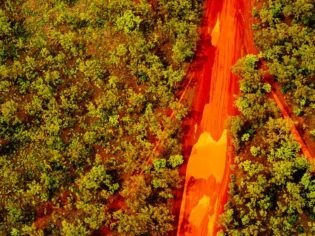 Once you’re in the park a sealed all-weather road runs right through the centre of the wilderness, roughly forming a triangle from the two highways with the township of Jabiru – 254 kilometres from Darwin, 211 kilometres from Pine Creek – at the apex. All of the must–see attractions, such as Ubirr and Nourlangie with their magnificent rock art galleries, tour hub Cooinda and the wildlife-filled Yellow Water Billabong are easily accessible from this main road, as are the popular accommodation options and most of the parks that cater for caravans. The jaw-dropping cliff-top plunge pool at the top of Gunlom Falls is on a gravel road, which is a bit rough and rocky but fine for most 2WDs in the dry, as are many of the camping areas. You could see all of these in a stock-standard sedan, but you’d probably be more comfortable in a small SUV if you are planning to drive on the dirt or head out to Gunlom. You don’t need a 4WD to see the best of Kakadu, although if you do have one there are a few special spots where high-range comes in handy. A 4WD will get you out to Jim Jim Falls and Twin Falls (although you still have to walk the last kilometre or so), Sandy Billabong, the more remote waterholes and some of the bush camping areas. You’ll also need a 4WD on the Old Jim Jim Road, which is a great shortcut from Cooinda to the Arnhem Highway. The bucket-list swimming spot: Jim Jim Falls in Kakadu National Park (photo: Sarah Mackie). Many of the unsealed roads that are fine for 2WD in the dry season, like Gunlom Falls, are 4WD-only in the wet. The tracks aren’t particularly difficult, but some can be rocky and slow and the river crossings can be a bit tricky in the wet. There are more than 25 designated campgrounds in Kakadu, ranging from commercial caravan parks to remote bush camping sites with no facilities at all, as well as bush campgrounds that have toilets and hot showers. Hiring a campervan is a great option if you have flown to Darwin: most come with basic camping gear. Avoid driving in the dark: your chances of colliding with a critter are very high, and most car hire insurance policies do not cover you for the damage. Many hire car companies will not allow their cars on dirt roads – even SUVs – so check the fine print. The visitor centres frequently run out of maps, so download one from parksaustralia.gov.au. The free ‘Visit Kakadu’ app (iTunes and android) is also useful, but the maps are easier to read on tablet than a phone. You’ll need a snorkel fitted to your vehicle if driving on 4WD tracks in the wet season. Fuel is available at Jabiru, Cooinda and Pine Creek. No fuel is available at Goymarr Roadhouse. Can go: The Arnhem and Kakadu highways remain open, as do the roads to Nourlangie, Ubirr and Cooinda, although they may close after big storms. Check the Parks Australia road report for Kakadu. Can’t go: The roads to Jim Jim and Twin Falls are closed. The best way to see these is on a scenic flight. Old Jim Jim Road, Gunlom, Maguk and Sandy Billabong are also out of action. Many minor unsealed roads are closed; those that remain open are 4WD-only and some bush campgrounds are closed. Check the road report for details. Check out our Kakadu FAQs for more.